Like the Army, the Marines break their enlisted jobs down into MOS's, or "Military Occupation Specialties." In the Marine Corps, the MOS's are FOUR digit codes used to organize and designate the variety of jobs and skills offered in the USMC. 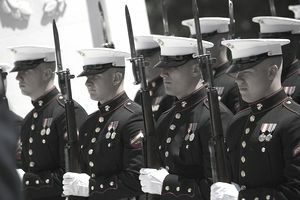 The Marines group MOS's with similar functions together into groups called "Occupational Fields" and are represented by the first TWO digits of the MOS. Below are the first two digits of the MOS. These identify a grouping of related MOSs. Job codes are identified in the last two digits and represent a specific job within that field. The first job you receive in the Marine Corps will be earned after boot camp and may involve advanced operator training and education. It will be called the Primary Marine Occupational Special (PMOS). As your career advances and you perform more advanced training, you may also earn additional MOS’s. An Additional MOS (AMOS), a Skill Designator, or Category II MOS denote special skills assignments and duties performed during a special tour or training program. For example, a job within the third MOS (03) is the Infantry career field. The code 0311 is a Rifleman, the code 0321 is a RECON Marine, and the MARSOC Code is the 0372 (Critical Skills Operator). The creation of the 0372 MOS was a response to the desire of MARSOC Marines to remain at MARSOC with an MOS that would allow them a Special Operations dedicated career path. Previously, the Marines who qualified as a MarSOC Marine Raider had to go back to the regular Marine Corps jobs for career advancement. Many went back to Infantry or RECON MOS, but now if a Marine so chooses, he/she can stay at Marine Special Operations Command throughout their enlistment. Now officers can do the same thing. Marine Officers especially had to go back to previous pipeline jobs such as infantry or artillery for instance. Now, after a Marine does three to four years active duty, he/she is eligible for MarSOC for the rest of their career. Click the above Occupational Fields to find the exact four digit MOS you are looking for. There are hundreds of jobs the military has that may interest you. Do your research and learn about your future profession options by reading the job descriptions/programs/education available to recruits and active duty and reservist members of the military. Your efforts into researching your future profession can go a long way to you enjoying and getting the most out of your military career and training. Also consider where these Marines do their training (what base?) and where you may live after you qualify with your MOS. Many have a preference to where they would like to live in the military. Being flexible, considering overseas duty, and other world travel maybe a major part of your life while in the military. Depending on your job, you could also be states bound and not deploy often. How Are Military Occupational Specialties Constructed?